Braised brisket makes the perfect Sunday Roast, that great British tradition. Sunday roast, also called Sunday lunch, is served in the afternoon (2 or 3 o'clockish) and traditionally consists of roasted meat (most often beef, chicken, lamb or pork--nut loaf for vegetarians), gravy, roasted or mashed potatoes, Yorkshire pudding and vegetables. The great thing about the brisket for Sunday lunch is that it is made on Friday or Saturday and just reheated on Sunday. Of course, you can have brisket any day of the week, but the aroma of it wafting out of the kitchen into my office made me nostalgic for those Sunday Roasts of my childhood. The roast was usually beef (my father's favorite) or pork. Occasionally it would be lamb (my mother's favorite) with homemade mint sauce. Poultry was not on. Apparently my father had eaten too much chicken, to the exclusion of any other meat, during his childhood; so we never had chicken, and turkey was allowed on the menu just once a year. I had to get my fill of Southern-fried chicken at my grandmother's house. Grandma had never tired of fried chicken, even though she had totally burned my father out on it! So Daddy much preferred to stay home and enjoy my mother's British-style Sunday lunch. Oddly enough, we all loved vegetables, and Sunday lunch always included two or three fresh seasonal vegetables. This brisket is not just any old brisket. This is an organic, grass-fed brisket kindly sent to me by Rocky Mountain Organic Meats. It is 100% grass-fed, grass-finished and certified organic. No hormones. No antibiotics. No grain. No GMO feed. No irradiation. No feedlots; the animals are allowed to roam free and are treated humanely. And Rod is going to ship a brisket to one of my readers! See bottom of the post for giveaway details. Update 02/18/17: I finally posted my Yorkshire Pudding - Yorkies that go so beautifully with this dish! 1 In 12-inch skillet (I use All-Clad 5112 Stainless 12-Inch Fry Pan), heat olive oil. Pat brisket dry and salt and pepper both sides with 1/2 teaspoon each. Brown well (up to 10 minutes on each side). Place fat side up in 2.5-quart oval Corning casserole or other suitably sized baking dish. 2 Preheat oven to 300 degrees. Add chopped onion, sugar, and 1/4 teaspoon each salt and pepper to skillet. Cook over low heat, stirring occasionally, until onions are softened and browned, about 10 minutes. Stir in tomato paste and cook about 2 minutes. Stir in broth, wine, Worcestershire sauce, marjoram and red pepper flakes. Bring to a boil, scraping up brown bits. Pour over brisket in baking dish. 3 Cover dish with foil and lid. Bake at 300 degrees for 3 to 3 1/2 hours. Remove lid and foil from dish and let stand at room temperature for 1 hour. Put lid on and refrigerate until next day. You can even do this two days ahead. 4 One hour before serving time, preheat oven to 350 degrees. Transfer cold brisket to cutting board. Remove fat from sauce. Strain sauce into 2-cup glass measure, adding water, if needed, to bring volume of sauce to 2 cups; discard onions. In 1-quart saucepan, heat sauce and stir in the slurry. Bring to boil, stirring constantly; lower heat and simmer 5 minutes, stirring occasionally. Taste and adjust seasoning. 5 Slice brisket across the grain into 1/4-inch-thick slices. Keeping the slices together, place them in 1.5-quart oval Corning casserole. Pour sauce over brisket. Cover dish with foil and lid. Bake at 350 degrees for 30 minutes. Mmmmm, mmmmm. mmmmm, this looks delicious! Many of your recipes have become household favorites (black bean soup, beef stew, Cabbage soup) at my house and it looks as though this one could too! My wife loves brisket so I'll have to give this recipe a go! Oh, Richard, thank you so much. That is very gratifying to me. I hope Marilyn will enjoy the recipe as much as we do. Hi Jean - I saw your tweet looking for a suggested wine with this meal, and thought I'd answer you here. If you had company over and wanted a conversation piece, find a Beaujolais Nouveau and learn about the history of this unique wine and production process. You have a lovely blog. Thanks for the chance at a big hunk o meat!! Thanks, Eric! Pinot noir is my favorite, always have it on hand. But I should branch out more often. Maybe next time I'll take your suggestion and go with a Shiraz or Petit Syrah or ... it's been ages since I've had Beaujolais Nouveau. Thanks, Melissa! The RMOM brisket was a wonderful hunk of meat! The brisket dish looks amazing! I'm sure that not all brisket is created equal, for this is the most beautiful I've seen! doorstep and we wouldn't complain one bit! Beautiful. We like making our own too, very similar to yours, and in the winter it's always with canned tomatoes. No one's the wiser, for no one cares. They just love that it tastes so great! Judy, thanks! I can almost smell it too. I can't wait to make it again. My husband could eat this every week. Ah, brisket! You know, that name really should belong to a cleaning product – "don't wipe it, brisk it!" But by any name, brisket is on my menu…even though I think your grandma had it right (long live chicken…or is it, long die chicken). I prefer brisket cooked by a Texan. A rodeo cowboy friend of mine – and great-grandson of hanging judge Roy Bean – used to cook it for three days and then lather it with his, shall we say, panther juice sauce. He did not call it panther juice. And that too, by any name, was so tenderized and juicy that it could be drunk – both brisket and pp sauce. Your photo looks equally drinkable! Thanks, Sully! It's always encouraging when a dish is approved by the president of the picky eaters club. You've probably noticed that I give my sauces tamer names than your rodeo friend's panther "juice," but they are really tasty! Wouldnt it be neat if as kids we paid attention to the grandparents making the Sunday roast? I would give anything to be back in the kitchen to see how she made the roast as it was melt your mouth, which is a far cry from the shoe leather I usually come up with. Perhaps I just need cooking lessons...where do you live again??? 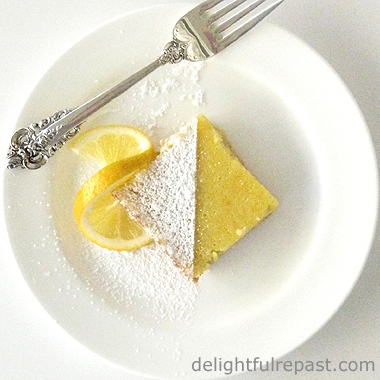 Yum...it's breakfast time here, but now I'm already thinking about making this for dinner! Hi Cheryl, my older sister was the one out playing hard while I was toddling around the kitchen watching my mother and grandmothers cook. My earliest food memory is of being in the kitchen with my grandmother making an apple pie when I was not yet three. I think of these women every day while I'm cooking! Like you, I would give anything to be able to do it again! But not to worry, just follow my directions to the letter--you can't go wrong. Kristen, thank you. Wish I was having it for dinner again! Oh my that looks scrumptious. I'm all over this recipe. The gravy alone makes my mouth water. Thanks! This is definitely a great Sunday dish. I am thinking this sunday would be great. Thanks, evanoff and ileen! Hope you'll both have a chance to try it soon! Love this recipe will try it this weekend. Thanks! Dishes like this are such perfect dishes for a Sunday day of rest! Thanks for sharing! Cindee and Audrey, hope you'll make it soon and enjoy it as much as we do. what a delicious sounding recipe - i LOVE the fact that most of the work is done ahead of time! Lovely blog and cool giveaway! Thanks, Laurel! If there is a way ANYthing at all can be made ahead, I'll figure out how! I love getting the work out of the way ahead of time. Thanks, Manda! Yes, it is a cool giveaway. RMOM has THE best beef! Leann, thanks! Hope you'll try it soon and let me know how you liked my method. Yummmm! Thanks! Can't wait to try. Alice, thanks! I hope you like it. The brisket looks amazing, Jean! I tried smoking brisket once and it did not turn out so great... I haven't gone back to it since. Could be my fear.. could be that I can't find it for less than about $30 for like 2 lbs and I just don't want to spend that kind of money.... if i can ever find it cheaper, i will definitely be trying this method! Your brisket looks amazing! I'd like to try to make a smoked brisket and serve it on buns with coleslaw and bbq sauce. Yummy. Oh boy Jean, that looks FANTASTIC! My mouth is watering already and my gut brain is going overtime! I want some of that for dinner today! Only problem is, I've never heard of a brisket, I'm not sure an Aussie butcher would know what that cut of meat is... I'll have to go ask our organic butcher and see what he says. This looks absolutley divine. I can't wait to try it. Brisket is one of my absolute favorites. Grant, thank you! I'm sure your organic butcher can refer to an American beef chart online and know exactly what it corresponds to in Oz. All I can tell you is it's from the lower chest, to the side, in front of the plate and below the chuck. Be sure to tell me when you find out! bconsbruck, thanks! I hope you'll try it soon and let me know how it turns out for you. oooo, I stopped by just in time. My shopping day is tomorrow. I'm adding ingredients to my list now. . .
Ruth, I'm so glad! Let me know how it turns out for you! This looks like a great recipe! I'm trying to switch to more organic meat. Thanks for the giveaway! Steel Springs, I'm so glad. I figure we can spend more now for organic meat (and other foods) or spend more later for health care! MCissell and loulou, thank you! I hope you'll try it soon. This recipe looks AMAZING an so does the brisket. Hope I win!!!!! Thanks, Steve! Wish I'd had some of it for lunch today. I wouldn't have been hungry just a couple hours later. the brisket looks amazing, you certainly made me hungry. And it brings back memories growing up in Germany where meals like this had been served almost every sunday. The most prominent dish my mom used to make was "Sauerbraten"
Louis, thank you! I don't think I've ever had sauerbraten, but I love rotkohl mit apfel (not sure about that spelling), cabbage rolls, chicken schnitzel and strudel! This sounds totes delish! Pinning it now! Aimee, thanks! I definitely think it's Pin-worthy. Me too! It's one of my favorite meals. *Rocky Mountain Organic Meats Giveaway Winner Announced* - The winner, by random drawing, of the organic grass-fed brisket is bconsbruck. As soon as you send me, delightfulrepast at aol dot com, your name, address and phone number (required by shipper), RMOM will ship the package to you. This was fun! Think I'll be doing more giveaways! In the meantime, follow me on Google and Twitter. You can even use the Follow Me By Email button in the right column. Come back tomorrow for a delicious light dessert perfect for spring! Thank you, Rachel! I hope you WILL make it very soon! *Announcement* If I don't hear from the winner of the random drawing by 11:59 am Eastern time Sunday, May 27, another drawing will be held and a new winner selected. Love a barbecue in the garden, Tony! I don't cook when it's hot either. But when I was a child we had these elaborate meals every day, rain or shine, hot weather or cold. If you've read my About page, you know that "I was born into a tradition of good food, the product of a father who, having grown up on a monotonous diet during the Great Depression, spared no expense when it came to food and a mother who was an inspired cook." We rarely ate out or got takeaway. My father insisted on a hot meal every evening. I don't know how my mother did it! *Announcement* Since I didn't hear from the winner of the random drawing by 11:59 am Eastern time Sunday, May 27, another drawing was held and a new winner selected from the original entrants (those who commented before the giveaway deadline). The winner is Ruth Schiffman! Ruth, as soon as you email me, delightfulrepast at aol dot com, your address and phone number (required by shipper), RMOM will ship the package to you. Congratulations! Thank you! Thank you! Thank you! I can't wait to make this again. We had it tonight for dinner and it was soooo good. I have been in a cooking rut for years. But your lovely blog and your encouragement have inspired me. I really want to thank you, Jean for sharing recipes that are delicious and yet even an amateur like myself can have success with them. Ruth, thank you so much! That is *exactly* what I hope every time I write a post. You just made my day! As always, Jean, you make it look so inviting! I love your focus on good farming practices and wholesome recipes. I've never actually fixed Brisket so this might be the time to give it a try. Thank you, Susan. I do like to make a big fuss over the farmers and ranchers who are doing it right! I made this recipe again with the Rocky Mountain Brisket from the contest. Delicious!! Thanks again. I'm SO excited to make this and to find a source for not only grass-fed but grass-finished beef. Sundays are going to get kicked up a notch at my house! Kate, that's wonderful, thank you! Let me know how the recipe turns out for you. I know you'll love the RMOM beef. Every single thing I've had from them has been great! Ruth, thank you so much! You just made my day! I hope everyone enjoys it tomorrow. Angela, I hope you'll try it soon. Really, even if you've never succeeded with brisket before, you can't go wrong with this if you follow my directions exactly. Let me know how it turns out for you. Yum. 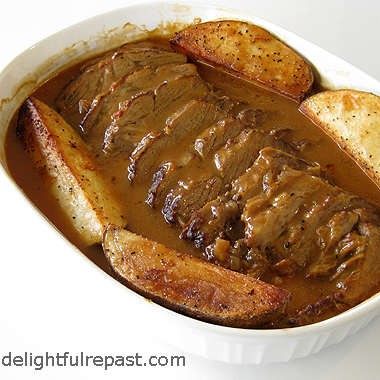 There's just something magical about a braised brisket and the gravy just brings it together beautifully! Thank you, Romain. I love gravy - it makes the meal!